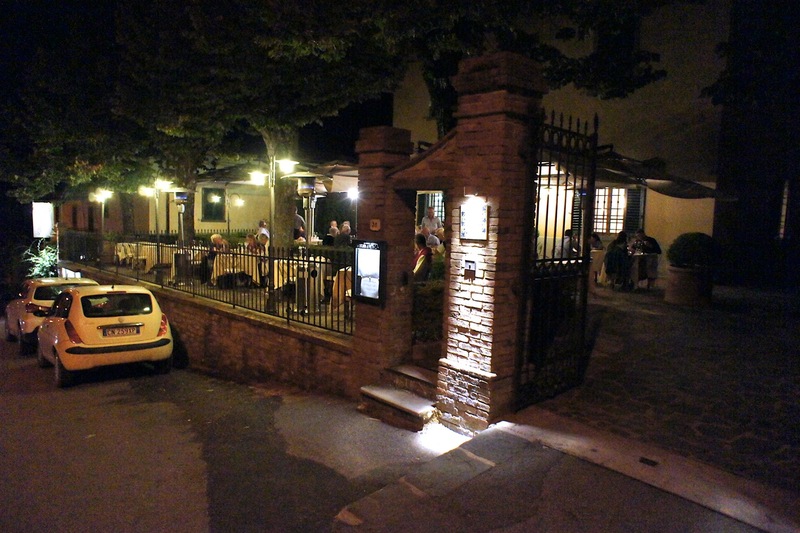 One of the challenges of finding oneself in Tuscany on a sunday is a lack of dining places for dinner. Fortunately for us, a good friend recommended one of the few places who would serve dinner on the Day of the Sabbath (though that would technically be Saturday) and this would be a restaurant located in a quaint little village an hour's drive from Florence called San Donato (in Poggio; apparently there are many small towns called San Donato in Italy). It is a Tuscan house located along the road just after the Madonna church in San Donato (in Poggio). 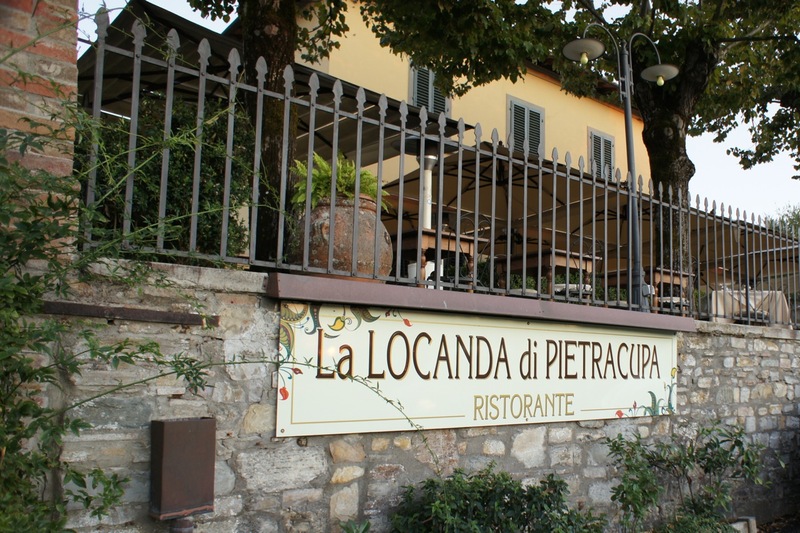 We had just finished a tasting at the vineyards of Fonteruli (when we proceeded to buy 5 cases of their best Sangiovese to be shipped home) and found ourselves early at the restaurant (Singaporeans get hungry easily and are often ready for dinner by 7pm). Unfortunately they told us that they weren't ready and asked us to come back at 7.30pm which was the time of our reservation. 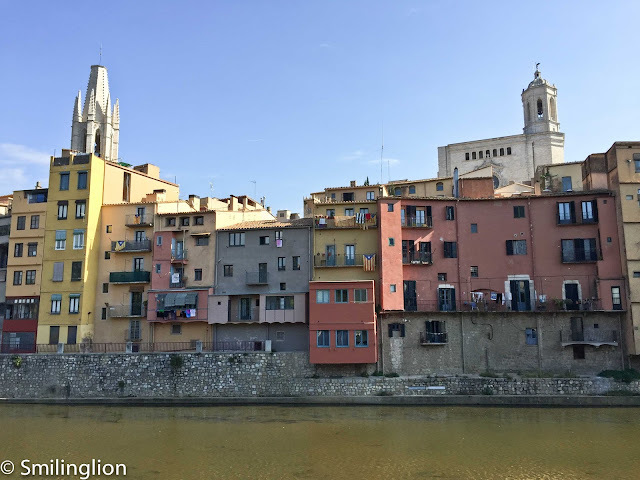 In the day, the view from the outdoor dining area would be that of the San Donato old town in the hills in the distance but at night this was not very apparent. We got a nice table at the furthest edge of the premises which would have given us a good view of the scenery in the distance if it were in the day, but at night all we could see were the cars passing by. 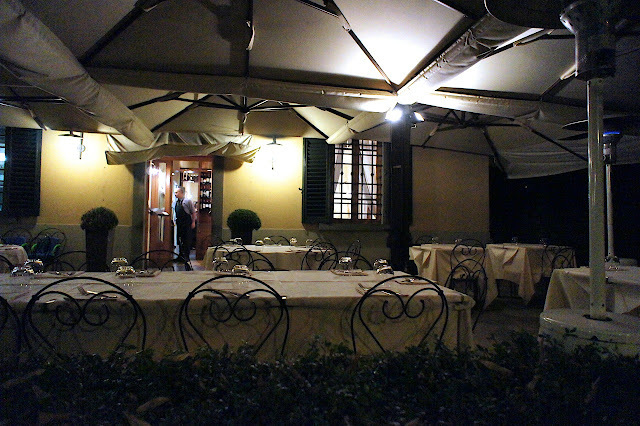 Nonetheless, it was a private table outdoors on an evening when the weather and temperature couldn't be more perfect for outdoor dining (20 degrees C with no wind and humidity). 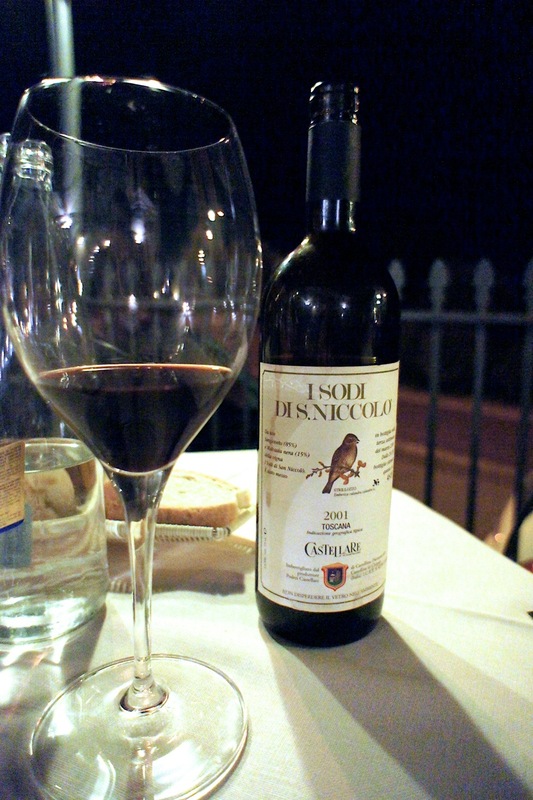 The restaurant has quite an impressive wine list, especially for the regional wines from Tuscany, and I selected a Supertuscan, the I Sodi Di San Niccolo 2001 (which was a good vintage) for a reasonable price. This choice was apt as it was produced at a vineyard not far from the restaurant. The wine was drinking well and was actually rather impressive though it paled in comparison to some of the other wines we had on this trip (which we will subsequently describe in later posts). We went a la carte for this meal. 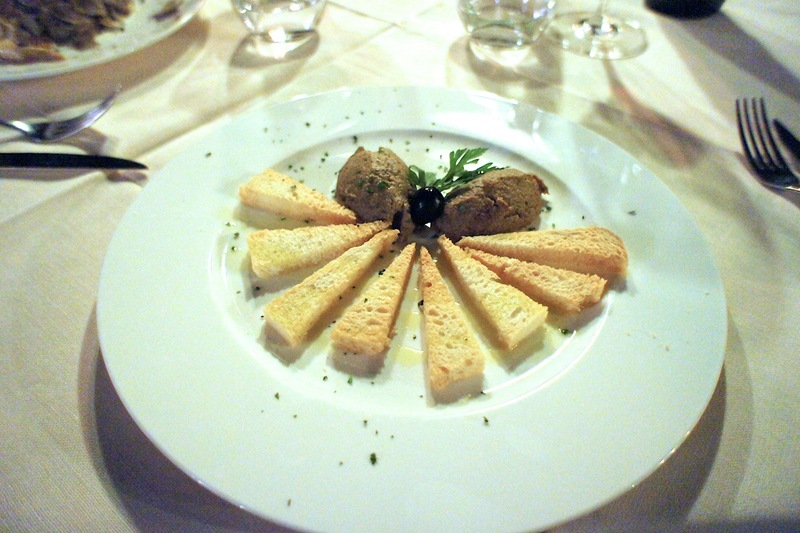 Terrina di fagiano: 'a delicious pate of pheasant meat' (the restaurant has a hilarious english translation of its menu) - we shared this as an antipasto and the pate was truly very delicious. It was a surprising good starter. 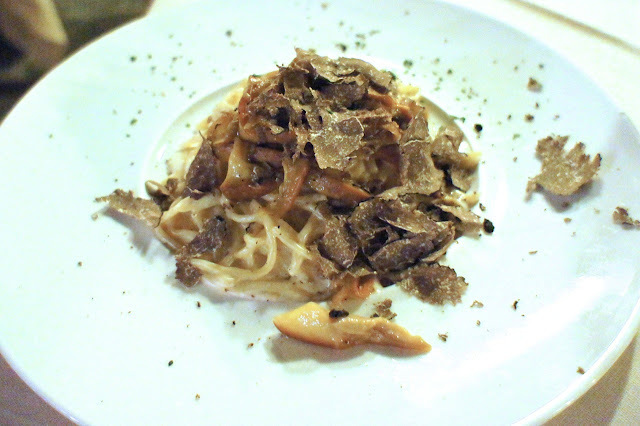 Tagliolini con ovuli e tartufo: 'homemade thinner tagliatelle simply dressed with butter fresh local mushrooms and truffle' - my wife ordered this as her starter. Very traditional and very good. They were also very generous with the truffles. 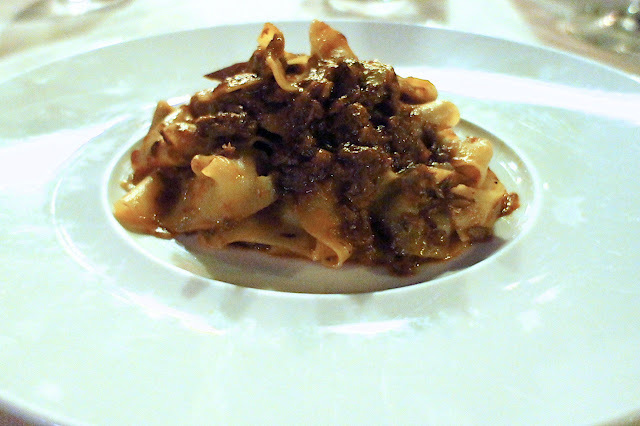 Pappardelle di semola con ragu di lepre: 'larger homemade fresh tagliatelle dressed with delicious wild hare sauce' - this was my pasta dish, it was very Tuscan, gamey and with a perfectly cooked homemade pappardelle. I enjoyed this a lot. 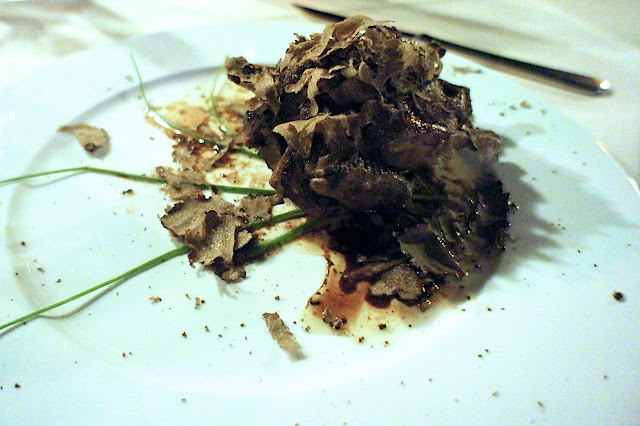 Piccione con vinaigrette tartufata: 'an unforgettable game dish: tasty baked pigeon flavored with delicious truffle vinaigrette' - this was my main course. Not exactly unforgettable but quite tasty nonetheless. I felt that the pigeon (it was an entire pigeon) was a bit overcooked, but the sauce was excellent and together with the truffles, made this a very good dish. Filetto con pepe rosa con verdure in tempura: 'a tender filet-steak of beef spiced with a delicious sauce and sprinkled with pink pepper berries, garnished with light fried vegetables' - this was recommended by the waitress and my wife had this as her main course. It was indeed very tender and flavourful. 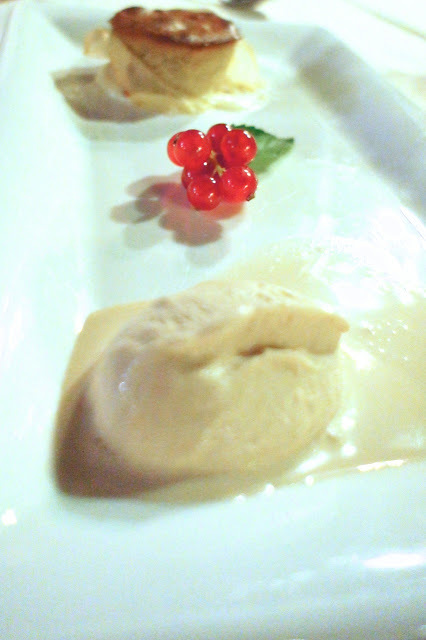 Flan di castagne con gelato di marrons glacees: 'chestnut flan with marrons glaces ice-cream' - We shared the dessert of chestnut. It was simple yet very nicely done. We were early, but by the time we left the restaurant was fairly filled up, including a busload of elderly German tourists who clearly knew how to eat. Final Thoughts: In all, this was a decent restaurant, but what really caught our attention was how affordable a meal here was. Essentially, the cost of the bottle of wine (which was not high) was about the same as the total cost of the food that we had. Hence it was probably our best value-for-money meal in Italy during this trip. 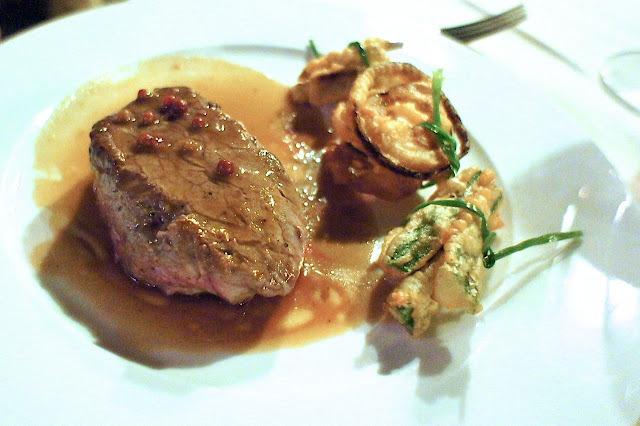 The food was also very traditionally Tuscan and quite well executed. Might be a great lunch location next time. You seem to be a fan of Super Tuscans and Barolo. May I ask why you do not drink Brunello di Montalcino? As a wine drinker, I am just curious. We love the Brunellos too! It's just that the Brunellos are generally more accessible where we're from so when we are in Italy, we generally prefer to seek out the Barolos and SuperTuscans as to us they are rarer (and more expensive) back home. We love all Italian (red) wines.